Get ready to lose all fear of Facebook’s complicated Ads Manager and find out how it’s possible to get eyes on your content and interest in your business. Julia Bramble is my guest on this podcast episode. She's a social media strategist, a coach, and a speaker. We met at Social Media Marketing World in 2017 and became fast friends. She helps small businesses and marketers get results from their online marketing in the simplest way possible. She worked as a forensic scientist for many years before turning to online marketing. Those years taught her to always be on the lookout for the next big thing that could improve results, and how to turn it into a repeatable process that you can depend on every day as fast as possible. Methinks her approach was also sharpened by the family of 6 children that she’s mother to!! She certainly didn’t have any time to waste while she developed her skills. She only ever shares simple solutions that have been tested in the field. In this episode you’ll learn how to get cheap exposure on Facebook, how to construct a sharply targeted audience (and when you don’t need to do that), and how to prevent overwhelm from the maddening number of things you can do in the FB Ads Manager. 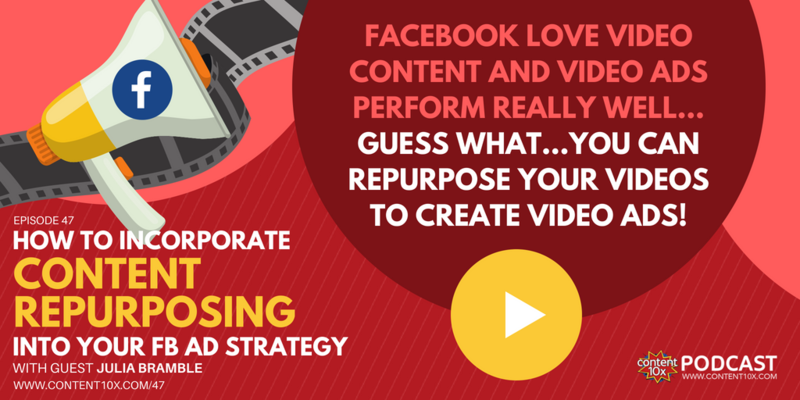 We also cover how to make compelling video ads easily by repurposing content. 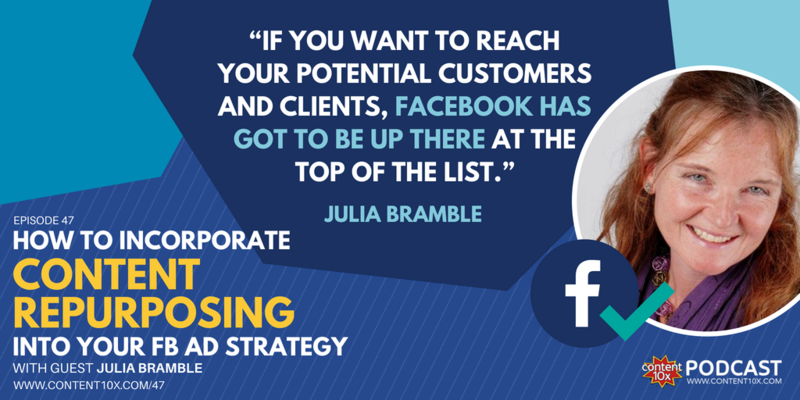 Julia knows how to help people focus on the things that really matter in Facebook advertising. To listen in to our chat hit play below or read on for a more detailed overview. 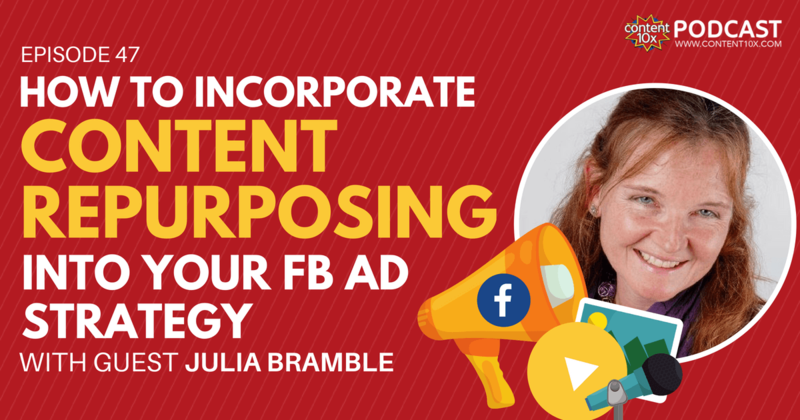 Thinking of trying FB ads to get more eyes on your content? By adhering to all Julia’s cost-cutting tips, you could get a video-ad viewed for one cent. That means you could get in front of a thousand people for $10. Now imagine each one was likely to be interested in your content and what your business offers…or even if only 10% were interested. Not bad for two glasses of cheap wine! Firstly, the video can be as ghetto as any others you produce. This is where repurposing comes in handy. You don’t have to create brand new videos just for FB ads, instead, repurposing the videos that you already create and use them for ads. Secondly, you can find the best audience through trial and error with small tests. Thirdly, your stated goal is merely the goal you tell Facebook you’re aiming at with each ad. We’ll get into more detail in a second. First, I want to highlight for you Julia’s simplest ways to get started. If you’re the learn-by-doing type, here’s how you can dive in this afternoon and not get overwhelmed without any other knowledge. For a complete newbie with a low budget who’s nonetheless inspired to dive right and run a Facebook ad, familiarise yourself with the Ads Manager by trying the following. Create a Facebook post with a nice image that gives your audience about 3 of your most useful tips. Use a chatty tone of voice like you’re talking to a friend over coffee. We get into choosing your audience later. At minimum, filter people who have “liked” pages devoted to books or tools (i.e. software) that indicate they might be interested in what you offer. For example, if you offer a course on increasing personal productivity, you might want people who have liked Getting Things Done and/or Todoist. You can set a daily budget as low as $2, run it for one week, and you’ll have some useful data by the end. Facebook will ask you what your objective is for the campaign, and then help you to optimise your post for what you want. I recommend choosing “Engagement” for your first ad. The idea is to get a feel for how the system works. The engagement goal will get you more responses and therefore more data, and Facebook won’t “mark you down” for not making a sale. See how it does, get a feel for the sorts of results Facebook can give you and take it from there. You can use an image or image + audio if you like, but the highest-performing format is certainly video. That’s why Facebook doesn’t charge you as much to run a video, to encourage the format that its users prefer. So, if they’re cheaper to run and they perform better, why isn’t every ad a video? Well, it might just be due to shyness, or maybe the belief that it needs to be something flashy and expensive. Not true! Let’s say you’re advertising an upcoming Facebook Live session of yours (which is a good idea since it eliminates the chance of talking to 0 people!). You could just pull out your phone and record a one-minute video explaining what you’ll be talking about. Include a few useful tips in the video itself. Why is this such a good first ad to use? Then, after your live session has been published, you can repurpose it into a few different new ads in no time and continue to draw more traffic in. Engagement will build up through comments and likes, and eventually the FB algorithm might kick in and start bringing in organic traffic. $10 is enough to test an audience. So, as Julia recommends, if you’re starting with $100 and you want to be sure most of it goes to the right people, devote the first $30 of it to running a little test. Define three audiences using the tips below, run each one for a few days with a $10 cap. Then, simply see which one performed the best and put the remaining $70 behind that one. None of this needs to be guesswork. 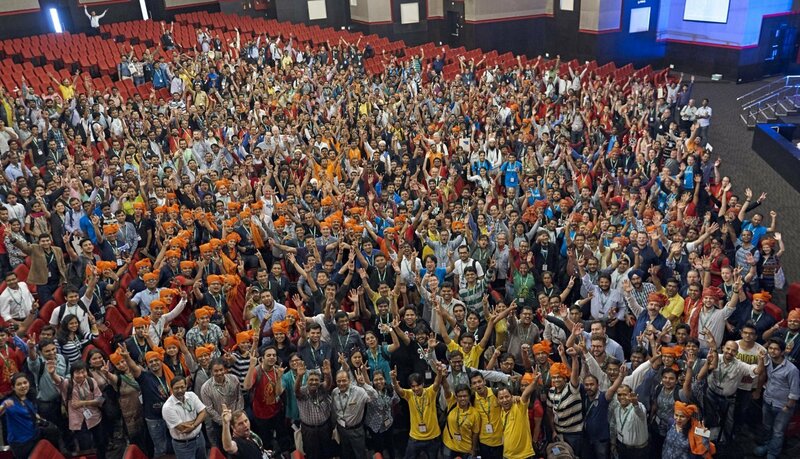 Here’s how you choose your first audience(s). First, are you a local business? If so, don’t drill down too much or you’ll wind up with such a small audience that Facebook probably won’t run your ads, or run them very slowly at most. Instead, define your audience by only location and perhaps one or two other broad attributes such as age or marital status. For example, if you’re a wedding photographer, you could target people within 100 miles of your home who are engaged! You can even target friends of an engaged couple. (Facebook is crazy). If you’re not too constrained geographically, you’ll benefit from drilling down much more. Before you dive into Ads Manager, however, do an hour of research into your people. What interests would they have that would separate them from the rest of the rabble? Are there particular books that they would have read or organisations they would belong to that would suggest they are actively doing something to address the problem that you can help them with? Too many newbie online advertisers use Facebook’s “interests” fields. They rarely tell you where someone’s head is really at. For example, someone might have clicked that they’re interested in entrepreneurship because they watched The Apprentice once on telly. In addition to their interests, brainstorm and research your audience’s behaviours and demographics. What age range are they in? Do they have kids? Are they married? Do all this research and brainstorming on paper before you go into the Ads Manager, or you’re likely to feel a little overwhelmed by all the choice in there. Know what you’re looking for before you dive in. Julia explained on the podcast that she’s had clients who were spending $5 per visitor to their website. With a little coaching from her, they tried an audience they’ve never thought to try before. Suddenly, their cost-per-visitor was $0.75. In case you missed it, the moral of that little story is to TEST! One small change could slash your costs to a fraction of what they were, or multiply your results. But don’t worry, you don’t need to bury your head in spreadsheets of data all day to run enough tests. I know you’re already wearing a thousand hats. Your ad testing does need to be consistent and ongoing, but not a . One weekly or fortnightly test is all you need to keep lowering costs and raising results over time. Both your audiences and your ad content need to be tested. You can create new video ads without spending much time on it by either repurposing your existing content or by summarising it with a quick talking-head video on your phone, as we talked about above. You can learn from all our previous articles about video repurposing here. If you’d like to hear more from Julia, you can find her almost everywhere as @JuliaBramble. Connect with her on Linkedin or check out her website at BrambleBuzz.co.uk.